Before we start, let’s get one thing straight: the name is Brussels sprouts, not Brussel sprouts. After all, there is no such thing as a Brussel; these delicious cabbage cousins take their name from the capital of Belgium, though no one knows for sure if they actually originated there. 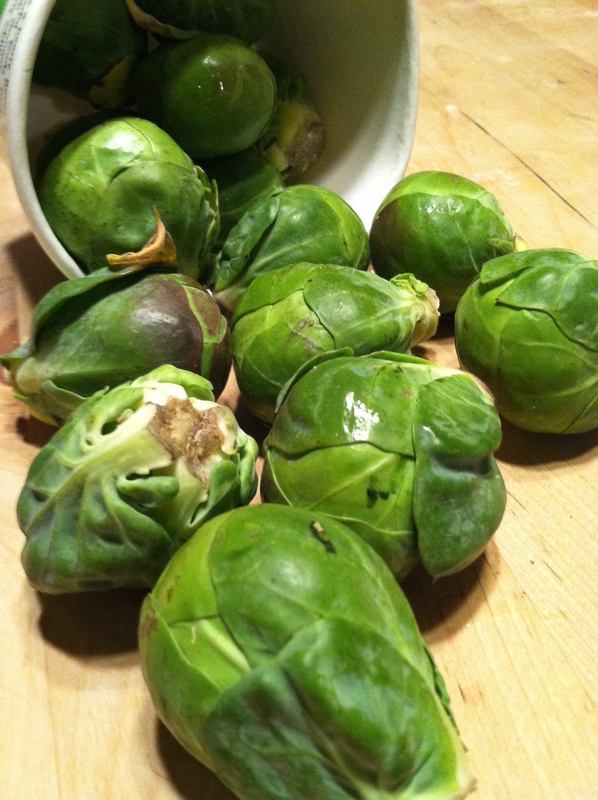 We all remember Brussels sprouts as the green menace of dinner, the monster guarding the road to dessert, a so-called “food” we pushed around and hid under napkins, preaching avoidance at all costs. But as we, and our palates, matured, the green menace began to take a much different and more welcome spot on our dinner plates. 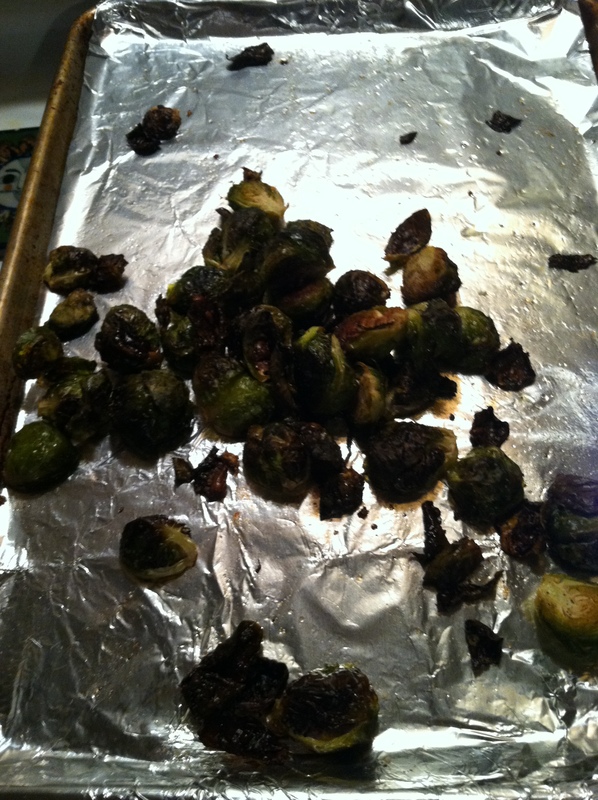 After seeing a piece by our friends at America’s Test Kitchen about the right way to roast your sprouts, we were inspired to re-exorcise those childhood demons. (Note: ATK requires a subscription or free trial to see their full recipes.) And hey, we gotta admit it – our parents were right on this one. 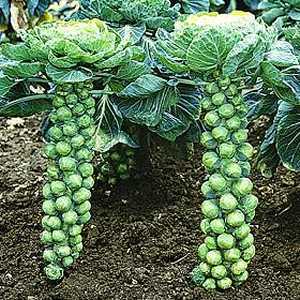 The sprouts of Brussels are delicious. Many recipes call for blanching your sprouts before doing a 20-25 minute roast – similar to how one partially boils potatoes before roasting, allowing for a tender interior with a crisp outside. Just remember – if you do decide to pre-blanch your sprouts, you have to shock them in ice water immediately after blanching to stop the cooking process and retain their deep green color. Steaming is also a good alternative to blanching, and a bit healthier. Steaming helps most veggies retain their nutrients, which can be lost during their time in the blanching liquid. We love the flashy silicone steamers for this. However, if you’re looking for a heartier crunch (we like to substitute these in place of french fries, for example), then straight roasting is the way to go. 1. After cleaning your sprouts, be sure to remove any browned outer leaves. 2. 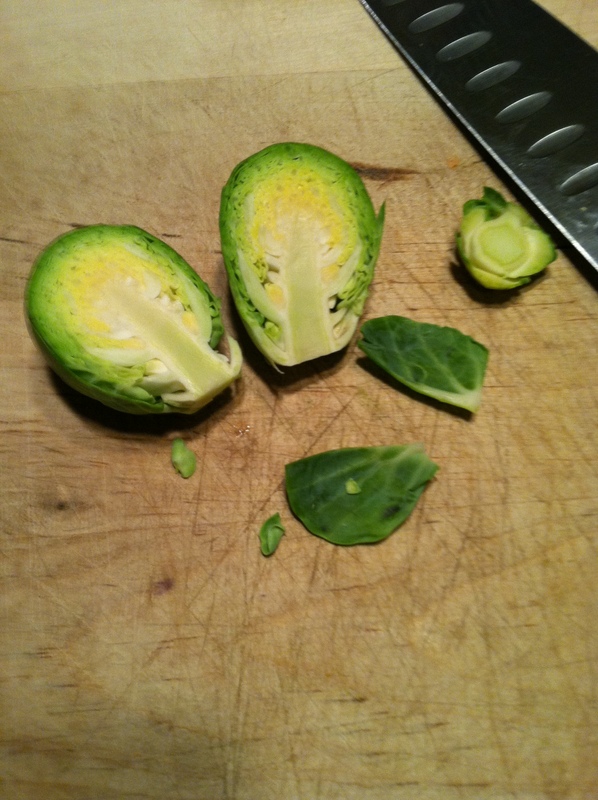 To prepare the sprouts, simply cut off the stump and slice them in half length-wise. The halved-sprouts will cook more quickly and evenly, since you’re left with uniform pieces. Don’t worry if a few outer leaves come off here or there. With the stump removed, the leaves aren’t held on very securely anyway. Just be sure to include these renegade leaves in the roasting! They come out extra crispy at the end, adding another textural layer. 3. 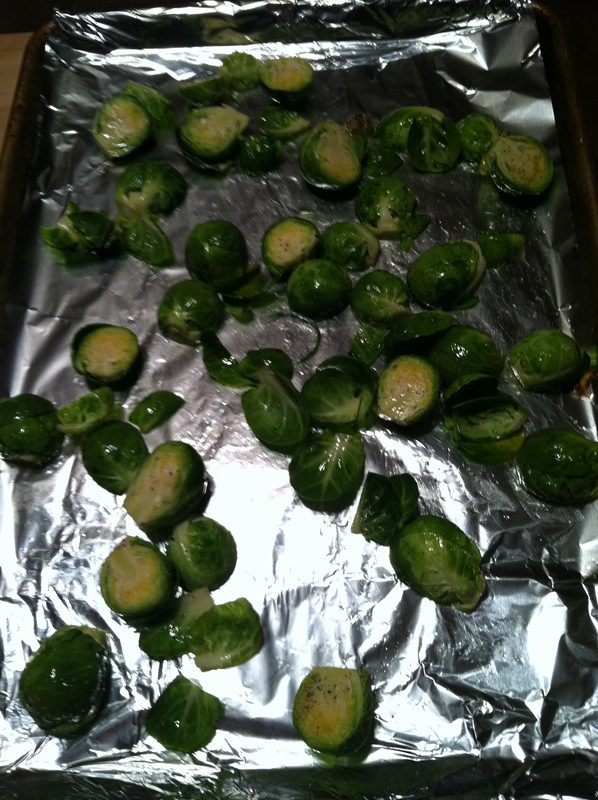 Toss the halved sprouts and leaves with olive oil, salt and pepper. You should alter the quantities based on how many you’re making – we used a dozen sprouts, halved to make 24, so we added about 2 tablespoons of oil, 1 teaspoon of black pepper and 1-1/2 to 2 teaspoons of salt. Of course, we prefer the salty taste with the sprouts, but the content is entirely up to you! Once they’re coated, pop them onto a tin foil-lined cookie sheet and spread em’ around so they have enough space to roast. And after that, you’re already almost finished – one thing we surely did not appreciate as kids was how easy Brussels sprouts are to make. Your final step is to just pop them into a pre-heated 400°F oven for 35-40 minutes, depending on your desired level of doneness. Like we said earlier, we prefer salty/crispy, so we lean more toward 40+ minutes. 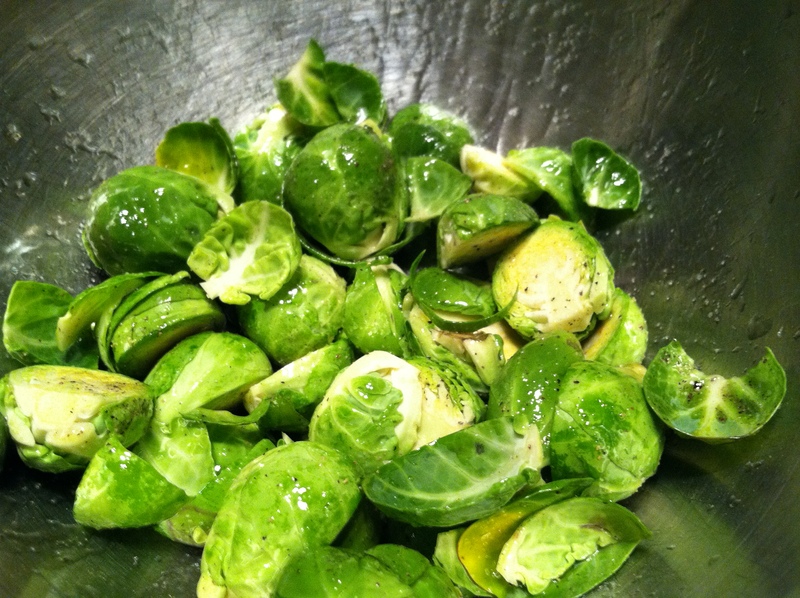 One final tip: shake the sprouts around in the pan a bit from time to time to ensure they crisp evenly. Serve immediately, and behold, the triumph of adulthood. Say it with us, now: BRUSSELS SPROUTS ARE DELICIOUS! Begone, green menace, and bother us no more.